Hard to believe it was 20 years ago... I do remember that show very well. The audience was estimated at 50,000. 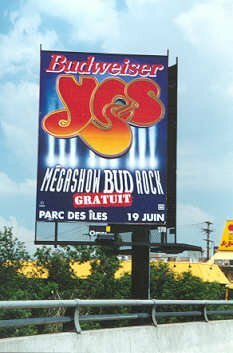 For a few years, there was a free show sponsored by Budweiser every june at the Parc des �les, which is located on a small island (hence the name) close to the Gilles-Villeneuve Formula One race track. (There are still big outdoor festivals at that location every summer.) If I remember correctly, it was rather hot and humid for that time of the year. The opening acts were Okoume, a local band that I never heard from again, and the Alan Parsons Project. It was the third time I saw Yes during the OYE tour, after Boston in October and Toronto in November. The highlight for me was definitely Close to the Edge replacing Revealing Science as the "long song" in the setlist. "Yours is no Disgrace" was also a nice addition. It was a very enjoyable performance, however I don't like outdoor shows in general (bad sound, no reserved seating) and the crowd was just too big for me. It this had been a paying gig instead of a free one, they probably would have played to 5,000 people instead of 50,000. So there were a lot of "tourists" in the audience... Lots of movement, people walking around the site, beers in hand, not the ideal setting to watch a Yes show. The good thing, however, was that I managed to make my way very close to the stage by the end of the concert and watch my hero Chris Squire up close. Ok, someone help me out here. How on earth did yes attract 40,000 people at this gig? ( ok, they would have done it in the 70's ) Many other dates on the open your eyes tour were played to smaller theaters. I know this gig was a free event. Did any old folk just turn up coz it was free or was there 40,000 genuine yes fans there? I have noticed there are a few more 40,000 plus dates too around this time. I have some informations concerning the June 19th show with AP/Yes. First, they open up to the public at 3 o'clock in the afternoon. Then there's going to be another band performing called Okoume (a french speaking group). I saw that in a tv commercial from Budweiser, maybe if you've seen more than the end of the commercial you could tell me if they said anything else important. Pretty damn good show tonight at the Parc des Iles in Montreal. A free show sponsored by Budweiser. My estimate is that there was about 40 000 people at various level of intoxication. But hey, you had to be on something to appreciate the stage with the Montreal skyline in the back. Loved Alan Parsons. Crowd very into it. Something spooky happened during Close to the Edge. A generator connected to a tour bus caught fire and flames and black smoke rised rapiidly on the left hand side of the stage. It made for a diversion and an added visual effect! I just saw a bit of Yes on Quebeqois TV. They were playing Long Distance Runaround, and guy was talking right over it. I heard something about a structure on fire, but Yes seemed to be alright. I wasn't really listening to the guy, as I was trying to hear LDR, so it could be totally unrelated. Open your eyes to further, more precise reports. The attendance was 50,000 people. They played only a small part of Ritual (About 3 minutes). Just before the song, Jon said that since most people in the audience speaks french, he would sing a song in french.